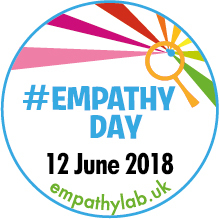 EmpathyLab piloted an Empathy Day last year and, due to its success, this is now going to be an annual event in the UK. This year it falls on June 12th and is a great opportunity for writers, teachers, librarians, parents, and anyone really, to put a special emphasis on books and stories that draw attention to and foster empathetic behaviour and its importance. We're not born with a limited quota of empathy. It's something that we learn and develop as children and throughout life - and it's important for many reasons. Being able to put ourselves in the shoes of others is a hallmark of civilised society. The beginnings of this ability to imagine how someone else might be feeling or what someone else might need begins in the early years. Its absence or lacking to a significant extent after a certain age may indicate emotional or a cognitive/developmental impairment of some kind. Some research shows an increase in hate crimes in recent years and no one will deny the need to acknowledge that many things cause divisions and cruelty in our world. Feeling empathy for others can lessen and prevent divisions and conflict. It is the starting point. Not only is empathy a natural human ability then, it is also essential. Stories help children identify with different characters and step into the lives of others. Recommending books that foster empathy on social media sites – using the hashtag #ReadforEmpathy (and we could recommend books like that anytime too). If you work with children then display books that foster empathy in classrooms, libraries etc Read them together and discuss the characters, their situations etc and what we can all do (adults and children alike) to get better at understanding others. Check out the Empathy Lab site and use some of their suggestions for drawing attention to the day. Sign up for their Empathy Lab toolkit and see their resources for use with schools or libraries. “Reading allows us to understand the world through the eyes of others. A good book is an empathy engine.” Chris Riddell. I agree, good to have a day to promote stories that help develop empathy. Thank you. As an extra thought I came across this today: "Books to give us hope"
Sorry about the long link - don't know how else to do it.